This beetle is 7-10 mm in size with a white spot on either side of the head. It has 7 black spots (spot pattern is usually 1-4-2) on the red or orange forewings from which this species derives its name. The body is oval in shape. The distinctive spots and attractive color make these beetles unappealing to predators such as birds. Additionally, if threatened these beetles can both play dead and secrete unappetizing fluids to protect themselves. Larvae are dark brown or nearly black, alligator-like. They are usually 7-8 mm in length and have three pairs of prominent legs. Eggs are spindle shaped and small, about 1 mm long. 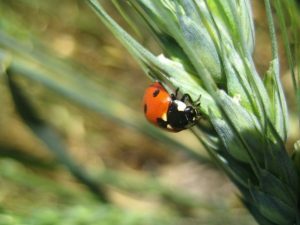 Both the adult and larvae are considered useful insects since they are major predators of aphids, scale insects, or mites which are pests in gardens, agricultural fields, orchards, and similar places. Within the colonies of such plant-eating pests, they will lay hundreds of eggs, usually underneath the leaf, well protected from the predators. The eggs are small (about 1 mm) and spindle-shaped. When the larvae hatch, they will commence feeding immediately. Additionally, female may lay 10-15 eggs around a place that the babies can find food once they hatch. Once the metamorphosis is complete, the larvae skin will split open. 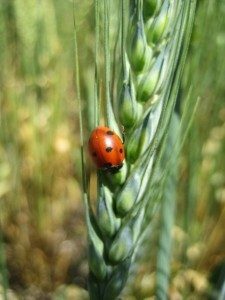 That is when the full grown ladybug will emerge; however, it will not look like the normal ladybug that we are used to seeing. It will look pale or soft and pink for a few hours until the actual shell hardens. While the shell is getting hard, it gains pigments, which is why the ladybug turns red. Adults can live for weeks or months, depending on the location, availability of prey, and time of year. These beetles have multiple generations per year. Overwintering adults may be less susceptible to recommended application rates of some pesticides than active adults and larvae. Gordon, R.D. (1985) The Coccinellidae (Coleoptera) of America North of Mexico. J. NY Entomol. Soc., 93: 1-912. Habeck, D.H., Bennett, F.D., and Frank, J.H. (1990) Classical Biological Control in the Southern United States. Southern Cooperative Series Bulletin No. 355, IFAS Editorial, University of Florida, Gainesville, FL. 197 pp.